Niche line Bond no. 9 will launch Madison Avenue, "the world’s first shopping scent", in April. Notes for the fresh chypre include apple, bergamot, blackberry, rose, jasmine, magnolia, patchouli, praline and ambroxan. Bond no. 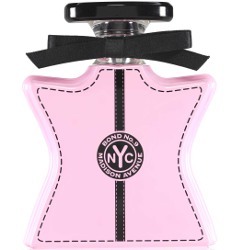 9 Madison Avenue will be available in 50 ($200) or 100 ($300) ml Eau de Parfum. A limited edition Swarovski bottle will also be sold ($375). The notes look like a jumbled mess and somehow doesn’t mesh with my idea of what a Madison Avenue shopper would wear. Speaking of shopping, I recently had occasion to go inside a Top Shop on Fifth Ave. and I swear they were piping in some kind of chemical vanilla fragrance – yuck. The bottle is cute, though. This copy reads like a draft of potential concepts sketched out in a quick email. It’s not only poorly written but confusing. And a 2nd perfume named after Madison Ave sounds like the result of a creative team that’s run out of ideas. Confused about the world’s first shopping scent. If I remember right, they already have a Harrods scent and a Saks scent. Personally I love New Haarlem and West Side, but can’t be bothered to test the Bonds any more. Way too many releases.